We offer commercial building services for customers throughout Huntersville. Whether you’re looking to replace an outdated building or construct a new business from the ground up, you’ll need a team of professionals that specializes in commercial building. 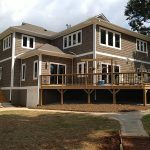 There are many unique aspects of commercial construction that are very different from residential construction, which is why it’s important to work with a company that has the experience and understands those differences. Commercial building codes are stricter and more complex, requiring accessibility and size regulations. If your new structure doesn’t meet these requirements, you could potentially face fines and other legal issues. At Chad Goodin Signature Homes, we offer commercial building services for customers throughout Huntersville, North Carolina. We have extensive experience with commercial construction in the area, so we know the rules and can help make sure your structure meets the legal requirements. When you make the decision to build a new commercial structure, we’ll be with you throughout every step of the process. Our design team can help create a look for your building that will be functional and visually appealing. We always use high-quality materials to ensure that your new structure will hold up well and continue to serve its purpose for many years to come. Additionally, our company is licensed as a general contractor, so we’re legally authorized to perform all types of construction and renovation jobs. Contact us at Chad Goodin Signature Homes to learn more about our commercial building services. We’d love the opportunity to bid for your project and help create the perfect structure for your business or commercial needs.